And it's been going on for years behind my back. I thought this person had changed her ways, but apparently she has not. Unfortunately, the misalignment of her own life causes her to take it out on others in calculated ways. When word got back to me, I was angry. Very angry. My mind flirted briefly with thoughts of revenge, but I knew that wasn't the answer. Instead of reacting and seeking vengeance, I knew my best course of action was to step back, take a deep breath, reflect, meditate, and let go. As much as I didn't want to, I knew I had to employ the "F" word. Forgiveness. But, I found my center, and I resolved to move forward because my happiness is more important. Some may see forgiving someone who has done irreparable harm as condoning that person's action. Forgiving that harm is like saying what was done is acceptable. Others feel that some acts should not be forgiven. If someone has taken a part of your life away from you by a criminal offense, perhaps you believe it's okay not to feel forgiveness toward that person. No one said forgiveness is easy. It's an internal process. It can't be forced. But it can be done. The first step is to get your own ego out of the way. The ego likes to dwell on past traumas and before you know it, you are entertaining thoughts of vengeance and hostility. As they take root and grow, you find your own bitterness consuming you. It won't let you feel any compassion, just unadulterated pain and rage. To get your ego out of the equation, it's important to forgive yourself. I know...not easy at times, but when you face what happened to you, you can mourn the pain, and then release it to the past. Staying stuck in the past robs you of enjoying the present. Realize you have a choice. You are not responsible for someone else's behavior. You can't control the actions of others, nor should you try. But you can control your actions and your thoughts. You can choose to stop reliving the hurt. You can choose to focus on the present, finding the joy in the moment. Commit yourself to letting go. When you commit to letting go, you commit to a process of changing the energy of the situation. It may not happen overnight, but the very act of making a decision to let go allows for forward progress. Try to see things from the offender's perspective. This is not to say that what the person did is right. The person may have done you wrong, but this doesn't make the person a bad person. Try to understand why the person did what s/he did. Know that everyone carries his or her own pain, which influences the decisions s/he makes. This doesn't condone thoughtless, selfish, insensitive decisions, but it does help you to understand that person. Having a better understanding helps you to protect yourself in future dealings with him or her. This is a tough one, but try to understand your responsibility for what happened. Ask yourself what you could have done to prevent it, or what you can do to prevent it from happening in the future. This is not about taking responsibility away from the offender or taking all the blame, and it's not about being a victim. It's about moving beyond feelings of victimization and claiming your share of responsibility for your actions. You have every right to even the score, but that will only compound the pain. It may make you the one who pays most dearly. Send the offending person blessings instead of curses. Hope for the best for him or her. This helps to neutralize ill feelings. It may feel contrived at first, but keep at it. Such a technique allows the mind to overcome the cognitive dissonance between hating the person and acting compassionately toward him or her. Forgiveness is not about erasing the past or forgetting what has happened. It doesn't mean the offending person will change his or her behavior; we have no control over that. It means letting go of the anger and pain and moving on to a better place. What happened can't be changed. By taking the path of forgiveness, you will show yourself and the person who offended you that the obstacles s/he tried to create were not significant enough to destroy you. Forgiving someone may be a lot harder than holding a grudge, but that would mean living life chained to the past. Interestingly, the Aramaic word for forgive is "shbag," which means to "untie." When you untie yourself from your hurt and pain, you are free to be happy once again. Please share your wisdom in the comment section. Thank you so much for sharing this! I love your attitude! Thank you, Angela. I hope this enlightened you. I appreciate you stopping by. Blessings to you. 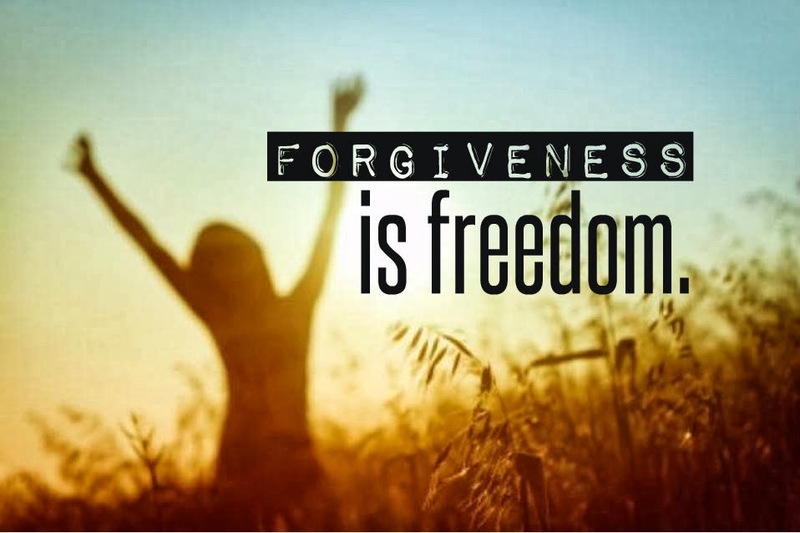 Yup, forgiveness and freedom! Thanks Di! LOL Not at all what I thought your title stated and to tell you the truth, knowing you, I was a bit shocked and thus had to read on. Now, that is a "F" word I can get behind. Most people have NO IDEA how un-forgiveness blocks them from allowing all they want. It actually is not so hard we you operate from unconditional love. Unconditional love for God, Self and others is the nearest we can get to God on earth and it literally dissolves away the EGO (edging God out) and thus makes it simple to forgive. And really, you forgive them for yourself, not for them. Un-forgiveness is a prison that you keep yourself in. Forgiveness not only sets your free but it opens up all the self created blocks so that all the good that is on your path can flow to you. LOL, Kathy! Yeah, I needed a catchy title! It was the first thing that came to my mind, so I went with it. Forgiveness is a spiritual practice that offers freedom and it is a divine gift. I hit the send button too quickly. Meant to add - Awesome post. Hope you don't mind the links - just easier than rewriting in a comment.